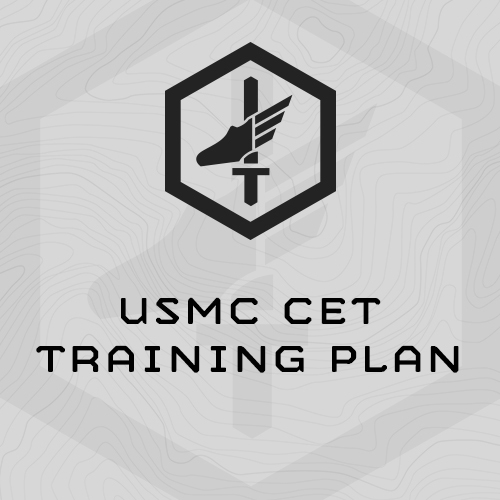 The following is a 7-week program designed specifically to help applicants prepare for the USMC Combat Endurance Test(CET). The USMC CET is a 14+ hour endurance test designed to simulate many of the challenges USMC infantry officers could face in combat situations. Many of the specific tasks involved in the CET remain closely guarded secrets. Participants are not permitted to discuss the events and reports are forbidden from giving away specific details. This plan is a culmination of all available open-source information and is designed with a sharp focus on improving your muscular endurance, stamina, and aerobic capacity. This program follows a general format and gets progressively harder each week. Training is designed in a Monday – Saturday format, 6 days on, 1 day off. If you are unable to follow this format, that is fine. Simply do the workouts on the available days of the week without skipping workouts. This program is designed to be completed exactly 7-weeks prior to participating in the CET. The plan includes 6 weeks of progressive training followed by a 1-week unload/taper which should lead directly into the CET. The program begins at a relatively high level. It presumes individuals preparing for the CET are currently training and prepared to, at a minimum, complete the following assessments during week one: 8-mile Ruck with 45#, Sandbag Get-Ups at 60# and the USMC Obstacle Course (O-Course). The program will be scaled to the individual based on their initial assessment performances. During this training plan you will not need access to a gym facility. All you will need to complete this program is: two pairs of combat utilities (CUU, MARPAT, ACU, NWU II, or similar); a tactical vest or 25# weight vest; an “assault-style” pack which can be loaded with 20#; a rubber riffle or 10# sledge hammer; and a 60# Sandbag. It is highly recommended that you have access to a standard USMC O-Course. The USMC O-Course is a major part of the CET and a common place of failure for applicants. We also recommend access to a swim facility. While the water portion of the CET is a relatively minor portion of the test, it still represents a major obstacle – especially when applicants are required to swim in full uniform, with gear. Note: The CET contains a number of non-fitness components like land navigation, weapons assembly, written exams and possibly others. This plan does not prepare you for these non-fitness events. However, by building your fitness you should be better prepared physically to address these non-fitness demands when they arise during the CET. We strongly recommend you train in your utility uniform whenever possible as this will be the uniform you wear during the CET. This is especially crucial during the mini-events and O-course portions of the training. For the swim training you should also wear your utility uniform, however tennis shoes can be substituted for boots if necessary.